On Thursday, April 12, 2018, a quarter pipe session was held as part of the 4th annual JP Auclair Memorial. 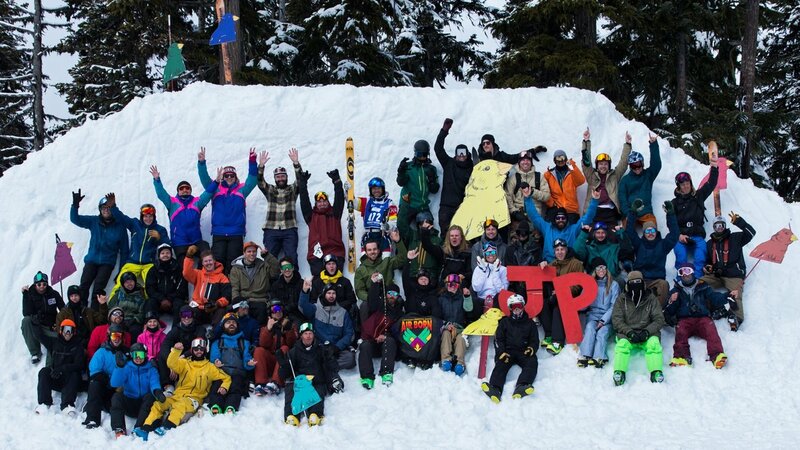 The event was presented by Newschoolers, Alpine Initiatives, and generously hosted by Whistler Blackcomb. Unfolding over an afternoon that saw snow and sun, the event was a testament to the freeskiing community that JP -- the iconic skier, the gap-tooth grinning prankster, someone great -- created. Perhaps buoyed by JP’s spirit, the session kicked off a stellar 48-hour trip into the midst of the World Ski and Snowboard Festival. Truly, there is nowhere else like it, and nowhere better to find the beat of Freeskiing's weird heart. Doug, my boss, has overseen this esteemed website since 2004, but he cut his freeskiing teeth in the glacial lanes of High North ski camp. Those were the early days, and Doug chased the dream, laying track across the country every summer, eventually working his way up to head digger at High North. He never made it pro, but he was there with the likes of Jeff Thomas, Pep Fujas and Anthony Boronowski. And JP. “I remember being so insanely star struck I almost passed out when I got him as coach,” Doug recalls. “He was basically the nicest dude ever though, and an exceptional coach.” When we arrived at the hill, Doug proudly planted the flag, flying skull and crossbones, at the top of the quarter pipe. Today Doug is 39, part of a generation of former freeskiers who, like him, have grown out of their twenties, their personal revolution, and faced the next chapter in life. They talk a lot about doing backend services for a company that monetizes endemic clicks. Or whatever. Most seem happy. Virtually none have paid any attention to freeskiing in the last 8 or so years. Unlike them, Doug has stuck around. He can still hear the music, even if it sometimes drives him insane. Skiing, in that way, will always deliver. “I just always get this weird feeling when I’m rolling into Whistler in the spring,” he said on the drive in, and I said I knew what he meant. Not going anywhere: TJ Schiller, Olympic broadcaster, on the mic. Katie Hitchcock and Jarred Martin enjoying beverages at back left. It’s hard to explain, but it’s the perfect place to be. Something about the sun finally cooking the paving stones in the village wakes the place up to skateboards and stagettes. Every evening is a party, everybody is excited to be there. The people just look good. They’re steeped in a season’s worth of shredding and hard work, they have got cause for celebration. So it was a welcome tribute to JP that the Memorial played part in the wider WSSF week. Without JP, there’d be no freeskiing as we know it; and without Whistler, no mecca. Kye Peterson, hoping to get flagged. | Ilana Barkusky photo. Legends in their own right, Anythony Boronowski, (left) and Ingrid Sirois (middle) are integral to keeping JP's spirit alive through this memorial. Tanner Rainville was there shredding, and KC Deane. Parker White was killing it, that was awesome to see. He brought a double backflip around enough to catch just his face on the deck, then bounced right back with a screamin’ seaman backflip, which drew hoots from the crowd. Kye Peterson, Stan Rey, Nick McNutt all threw down. Which is cool, because there were more on hand today than just your ordinary crew. Picture Mike Douglas dropping in on the quarter pipe, around 2:00pm. TJ Schiller was on the microphone and he said, not lying, “here goes Mike D… he invented the sport.” The Salomon 1080 skis strapped to Douglas, the Godfather’s, feet, the ones he designed with JP in 1997, kicked off a revolution that is still being remembered here, 21 years later. In all, the session was like a great party, that no one wanted to leave. Rather, each guest just wanted to stay inside, to greet old friends and make new acquaintances. Laps were taken, drinks were poured. Time slowed just down, just for one lovely afternoon. And at the end, when the last group photo was snapped, Rory Bushfield called us all to take one moment, just a moment, to thank JP, for bringing us to where we are, here.